Portland and Vicinity. Boston and Vicinity. Providence and Vicinity. New York and Vicinity. Albany and Vicinity. Baltimore and Vicinity. Philadelphia and Vicinity. Charleston and Vicinity. Savannah and Vicinity. New Orleans and Vicinity. St. Louis and Vicinity. Louisville and Vicinity. City of Nashville. Niagara Falls and Vicinity. Cincinnati and Vicinity. This is a fine 1835 map or plan depicting the principal cities in the United States by the important American mapmaker T. G. Bradford. 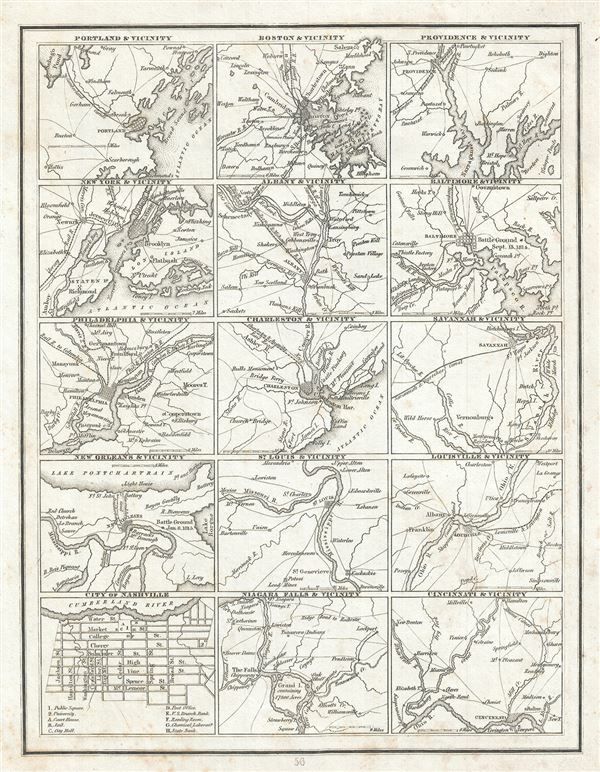 Essentially fifteen plans on a single sheet, it covers the cities of Portland (Maine), Boston (Massachusetts), Providence (Rhode Island), New York City, Albany (New York), Baltimore (Maryland), Philadelphia (Pennsylvania), Charleston (South Carolina), Savannah (Georgia), New Orleans (Louisiana), St. Louis (Missouri), Louisville (Kentucky), Nashville (Tennessee), Cincinnati (Ohio) and Niagara Falls. Each plan features the city and its vicinity and notes rivers, islands, towns, roads and a host of other important features. The plan of the city of Nashville is especially detailed, noting individual buildings and streets. It includes a key in the bottom. This map was published as plate no. 56 in Thomas G. Bradford's 1835 Comprehensive Atlas Geographical, Historical and Commercial. Bradford's atlas, published in 1835 was an important work on many levels. First, it was one of the first American atlases to follow an encyclopedic format, offering readers extensive geographical and statistical tables to supplement the maps themselves. Second, it was published in Boston and influenced the city's rise as a publishing center later in the 19th century (at the time most publishing in the United States was restricted to New York and Philadelphia). Third, this atlas was the first to contain a separate and specific map showing the Republic of Texas. Fourth and finally, Bradford's atlas in some instances broke the Euro-centric mold regarding atlas production. Among other things, Bradford focused his atlas on the Americas and abandoned the classical decoration common in European atlases in favor of a more informational and inherently American approach.